Professional DJ services at affordable rates with no hidden fees! Just about everything. Since we perform at different types of events from graduation parties to retirement parties, we know how important it is to have a wide variety of music available. Our library is updated weekly to ensure we have the latest music for your event. We have more than 50,000 song titles for you and your guests to choose from! Who will be our DJ if we hire Digital DJ’s for our event? Digital Dj’s employs a selected few disc jockeys that we feel are the best at what they do. We do not overbook events, nor do we “farm out” your event to other DJ companies. In the future, Digital Dj’s may expand, carefully adding more qualified DJ’s. Absolutely! We have an extensive collection of music for you and your guests to choose from. What if there’s a song that I don’t want played? Not a problem. We’re happy to work with you PRIOR to your event to go over all the details including what songs or types of music that you may not want played. And because you can create your own playlist online at anytime, you can easily add DO NOT play songs if you’d like. If I bring CD’s, will you play them? Yes! We’re asked this quite often and our DJ’s always have Professional CD players for such a request. How are your rates compared to other mobile DJ services? Our rates are very reasonable and competively priced. In addition, you can log into our online system anytime to make payments for the amount you choose. How much notice do I need before booking a DJ? Obviously, the earlier we’re aware of an upcoming event, the better. However, we do realize things come up, and we’re happy to provide an experienced mobile DJ on short notice. What if I need a DJ right now? How far away will Digital Djs travel? Currently, we serve the entire state of Ohio, but our DJ’s are willing to travel out-of-state. 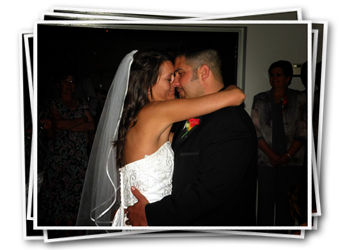 We’ve provided entertainment to clients in Pennsylvania and we’re happy to accomodate anyone needing our services. We currently accept all major credit cards, Paypal, cash, check, and money orders. You can get a FREE quote or book online 24 hours a day. Simply click here to get started! I’ve reserved my date. Now what? After signing a contract and making your deposit payment, you’ll be e-mailed login info in order for you to access the online planning area of our website. Once logged into the Client Area, you can plan your entire event. How do I contact Digital Djs? Feel free to call us anytime at 330-327-2816 or EMAIL us! …Let us host the celebration! Whether its your 5th, 10th, 25th, 50th or any anniversary, we would be honored to provide the service. Our shows are hosted by energetic Digital DJ’s staff members and guaranteed to keep things flowing and upbeat. We handle coordination of the event (Master of Ceremonies). Your birthday party is hosted by energetic Digital DJ’s staff members who guarantee to keep things flowing and upbeat. …Are a time to party! Your school dance is hosted by energetic Digital DJ’s staff members and guaranteed to keep things flowing and upbeat. We play the music of your choice (radio friendly)! We have a massive song selection! Over 60,000 songs! Including pop, dance, country, oldies, rap, rock, swing, traditional, Christmas, new wave and all the Top 40 hits. Plus we are adding songs weekly. We’re able to handle all your school dances, from homecoming to prom.